The two women wearing the traditional black dress with their heads covered climbed the hill shrine at 3.38 am Wednesday. Thiruvananthapuram: Two women of menstruating age group, cloaked in black veils, created history on Wednesday as they stepped into the Sabarimala temple of Lord Ayyappa, breaking a centuries-old tradition defying dire threats from the Hindu right. The landmark development sparked violent protests Kerala by the BJP and Hindu right outfits, with the state secretariat turning into a veritable war zone for nearly five hours as the ruling CPI(M) and workers of the saffron party clashed, pelting each other with stones. Police used water canons and burst teargas shells to bring the situation under control. 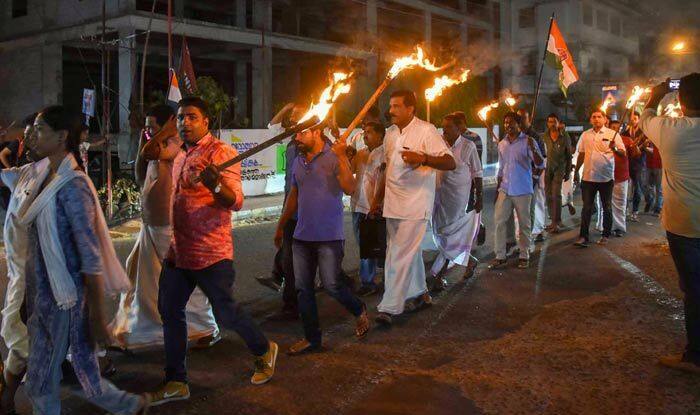 Chief Minister Pinarayi Vijayan’s effigy was burnt at Malappuram and four activists of the BJP’s Mahila Morcha were arrested when they forced their way close to the chief minister’s office in the secretariat complex. The women — Kanakadurga (44) and Bindu (42) — wearing the traditional black dress with their heads covered climbed the hill shrine at 3.38 am Wednesday. The women trekked the hill a day after the state-sponsored 620-km-long ‘wall of women’, which was formed from Kasargode in the northern part of the state till the southern-most district of Thiruvananthapuram. As the news spread like wildfire from the hill shrine, protests erupted at several places, with Hindu right-wing activists blocking highways and forcing closure of shops and markets. The ruling CPI(M)’s offices were vandalised at several places causing tension, police said. State-owned KSRTC buses were damaged at Konni and Kozhencherry in Pathanamthitta district where the temple is located besides several other places. Devaswom Board offices attached to temples across the state were also locked up. Several policemen were injured in the violence. People from media were also attacked by BJP activists in front of the secretariat, officials said. Sabarimala Karma Samithi, an umbrella organisation of various pro-Hindutva groups, spearheading protests against the Supreme Court’s September 28 verdict, and Antarrashtriya Hindu Parishad (AHP), have called a state-wide shutdown on Thursday, when the Congress-led UDF said it would observe a “black day”. Fed up with the frequent shut-downs in Kerala, quite a few trade bodies and merchant organisations have decided to defy the call and keep their establishments open. Soon after some local TV news channels aired visuals of the two women trekking to the hilltop temple, Chief Minister Piranayi Vijayan, whose Left Front government is weathering a storm of protests by hardline Ayyappa devotees over his determination to enforce the apex court verdict, announced they had indeed offered prayers at the shrine. “Earlier, women were not able to enter the temple due to certain hurdles. They may have entered the shrine today because they would not have faced any issues. It is a fact that the women have entered Sabarimala. Police have given them security,” a visibly pleased Vijayan said. Scores of women had made valiant attempts to visit the shrine since the Supreme Court verdict but were forced to retreat, menaced by hardline Ayyappa devotees. Nobody knows exactly when girls and women of reproductive age were forbidden from offering prayers at Sabarimala, but according to a 19th-century British survey report the ban was in place even 200 years ago. The informal restriction had got legal ratification and acceptance following a Kerala High Court judgement in 1991. People from media were also attacked by BJP activists in front of the secretariat. Quite a few trade bodies and merchant organisations have decided to defy the bandh call and keep their establishments open.